Democracy Denied by Americans for Prosperity vice president Phil Kerpen is a guide to understanding and defeating the radical agenda that President Barack Obama is implementing by unilateral regulatory action through his agencies and czars. Leading Psychologists Take an Unauthorized Look at the Most Elaborate Psychological Experiment Ever Conducted . . . Survivor! I saw this and had to share. 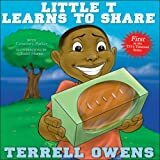 This is the first in the Torrell Owens children's book series. Just the role model you want your kids learning life lessons from.